From US 220 Business southbound. 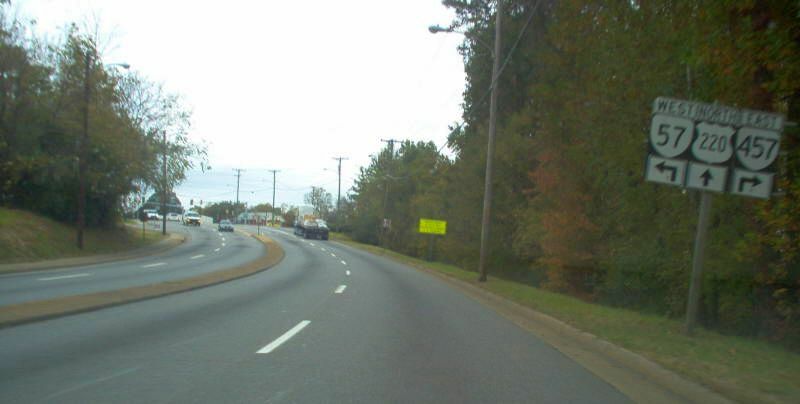 Unposted is the shield indicating VA 57 east is with US 220 Business. Photo by Mapmikey, taken September 23, 2006. From VA 457 westbound. Again unposted is the shield indicating VA 57 east is with US 220 Business. Photo by Mapmikey, taken September 23, 2006. From US 220 Business northbound. Photo by Mapmikey, taken October 26, 2006. Beginning down VA 457. Photo by Mapmikey, taken September 23, 2006. From VA 57 eastbound. Photo by Mapmikey, taken September 23, 2006. From VA 57 westbound. For years VA 57 used to follow 457's routing through Martinsville. Photo by Mapmikey, taken September 23, 2006.